Forget about the "outrage" over his comments on Tiger Woods and Phil Mickelson approaching their autumn years — "Yeah, I was surprised. I didn't think I said anything wrong...I've said much worse to Tiger to his face" — McIlroy can wait a fortnight before he becomes the target man for the US Ryder Cup team. This was an important round for McIlroy, who wants to add the FedEx Cup to his resumé, not to mention $11.4m to his piggybank as he, almost certainly, contemplates buying himself at Gulfstream jet to ease those world travel headaches. "I could have let the round get away from me a little bit, but hung together well," McIlroy said. "I haven't been firing on all cylinders for the past couple of weeks. I didn't have any sort of timing out there the front nine." McIlroy is one of five players who know victory at East Lake would also see them secure the overall FedEx Cup title, the others being leaders Kirk and Horschel (66 each), Bubba Watson (67) and Hunter Mahan (74 and next to last alongside fellow US Ryder Cup wildcard Webb Simpson). And the world number one was just two off the lead after playing his first nine holes in one under par on a tough scoring day. A superb approach to two feet set up McIlroy's first birdie of the day on the third, but he promptly gave that shot back after a poor drive on the fourth and hit an even worse drive on the next only to get a friendly ricochet back into the rough. He almost birdied the hole following a superb approach before he birdied the sixth from six feet to get to one under. Two visits to sand on the seventh cost him a bogey, but McIlroy again rebounded immediately with a birdie from eight feet on the eighth. He failed to birdie either of East Lake's par-fives, a rare occurrence for one of the world's biggest hitters, bogeyed the par-three 11th after a poor chip and then reeled off a series of pars before making a crucial on at the 16th. Out of position again off the tee, he had to hole a nine footer for par and did so to keep his round going before playing the 17th perfectly — 329 yard drive down the middle, 130 yard approach to 11 feet and one putt. Under par now, he bunkered his tee shot at the 18th but splashed out to four feet and holed the putt. "It's not a week to give up," he said. "It's a week to keep hanging in there and having a nice couple par putts and looking forward to the finish. Hopefully I can show a little bit more consistency over the next few days." As for the whole Woods-Mickelson furore, he admitted he was taken aback by the negative reaction to his comments in his media conference on Wednesday, when he denied that the absence of the Big Two from Atlanta signified a changing of the guard. Having said that both players would be back in Atlanta many times in the future, he may wish he'd used other words other than "the last few holes of their careers" when summing up the many physical ailments that have taken their toll on two players he clearly likes and admires. “I just couldn’t understand the backlash. I’ve said far worse things to Tiger’s face!” McIlroy said. “It wasn’t like I was writing them off at all. "I just said Tiger didn’t get the chance to play here because he was injured, and that Phil’s played great at times. I said that we’ll see them both back at this event plenty of times. "Q. This is the first time since 1992 that Tiger and Phil have not played in the TOUR Championship. Do you feel like that symbolizes a changing of the guard? RORY MCILROY: Not really. I mean, Phil has played well in parts this year. He came really close to winning the PGA. He's had a few good‑‑ I feel like he's gotten a little better as the year has went on. But it's a lot of golf for him to play in such a short space of time. So you could see he was getting a little tired the last couple of weeks. And, I mean, Tiger's not here just because he's been injured or he is injured. He hasn't had the opportunity to play. But I think if he gets back and when he gets back to full fitness, you'll see him back here again. So I'm not sure‑‑ they're just getting older. Phil's 43 or whatever he is and Tiger's nearly 40. So they're getting into the sort of last few holes of their career. And that's what happens. You get injured. Phil has to deal with an arthritic condition as well. So it obviously just gets harder as you get older. I'll be able to tell you in 20 years how it feels." Naturally, all hell broke loose on twitter and other social media platforms and within hours McIlroy was on twitter clarifying his remarks. Golfers on average have a 20-25 year career, both into the back 9 of their careers... Don't think there's anything wrong with saying that. As for the Tour Championship, the presence of Kirk and Horschel at the top of the leaderboard was made all the more painful for US skipper Watson by the sight of wildcards Simpson and Mahan bringing up the rear, especially as we are in the.... last few holes of the Ryder Cup build up. Roru McIlroy speaks to a radio reporter after this third round. Rory McIlroy believes it may take a closing 65 or even a 64 to win the Tour Championship and the $10m FedEx Cup. 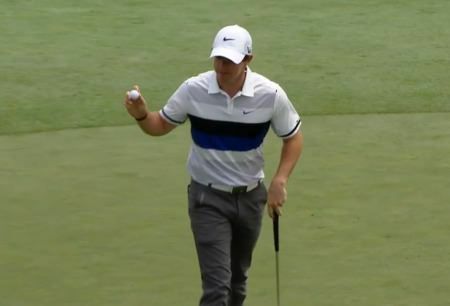 Rory McIroy shot a four over 74 on Sunday and had to settle for second place in the FedEx Cup and 10th in the Tour Championship.Rory McIlroy wanted a closing 64 but had to settle for a 74 instead and second place behind Brandt Snedeker in the race for the $10m FedEx Cup bonanza.